I grew up in Southern California, and as such, I frequented the beach. 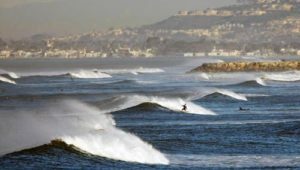 I have many fond memories of playing in the sand, boogie boarding, and surfing at many popular spots along the coast. However, one day in particular really shook me up. My friend and I were playing in the water all morning, and then the wind really picked up. Being kids, we really didn't pay much attention to it, but the surf became larger and larger, with the waves becoming more wild and unpredictable. We were amazed at how quickly the ocean could change, and we thought it would be courageous of us to go out and play amid the now more playful scene before us. At first, it was fun, as we were both pretty good swimmers, and frequently played in the ebb and flow of the current. But then the waves became unruly, and we quickly found ourselves over our heads. One particular set of waves crashed upon us with reckless abandon, leaving us tumbling in the whitewater. Although it was probably only 25 seconds, it seemed like eternity that the ocean held us within its grasp. When we finally surfaced, we had just enough time to catch a breath, before the next set fell upon us. I attempted to swim to the surface, only to run into the sand, as I was so disoriented, I though down was up. One more set of waves attacked us, and we started to feel burdened. With a lack of oxygen, and our muscles tiring, our hopes of returning to shore seemed to wane. We were no longer excited to be out there, but found ourselves fighting for our lives. Often, depression feels overwhelming, as though we are submerged under the burden of hopelessness and despair. Sometimes, the though of ending your life can seem like a viable option to end the suffering. Its at these times where we need to seek the assistance of trained professionals who can intervene with theory supported clinical direction. While clients in treatment rarely find immediate relief, the ability to regain the hope that change is possible is often what allows for an eventual alleviation of depressive symptoms. Typically, therapists focus on adjusting thoughts, behaviors, emotions, and relationships in order to facilitate therapeutic change when treating depression. There are many available resources which assist therapists to treat this presenting problem, including assessment instruments, client workbooks, research, collaboration with prescribing medical providers, family support, and using the self of the therapist. If you or someone you know is struggling with the symptoms of depression, there is help available. Most mental health professionals are trained in ways to effectively treat depression, in is various forms. Sometimes, reaching out for clinical support is the most difficult part. My childhood friend and I made a last ditch effort to signal his older sister who was still on shore. She was pacing the beach looking for us, and when we caught her attention, she came out to us on a boogie board. Luckily, the waves kept moving us towards the shore, and when we met up with her, we held on until we finally reached the beach. We were so grateful that we had assistance that day, and the drive home was pretty solemn. We had a new respect for the ocean, which served us well in our many adventures at the beach over the next few years.